← So far, so great! All is well with me. Now I am on a bit of a break for the next couple of months. I do meet with my Oncologist next week so he may have a different plan. I came off the Prednisone this week and am feeling a little fatigued. I guess the radiation caught up with me. I haven’t slowed down too much, though. 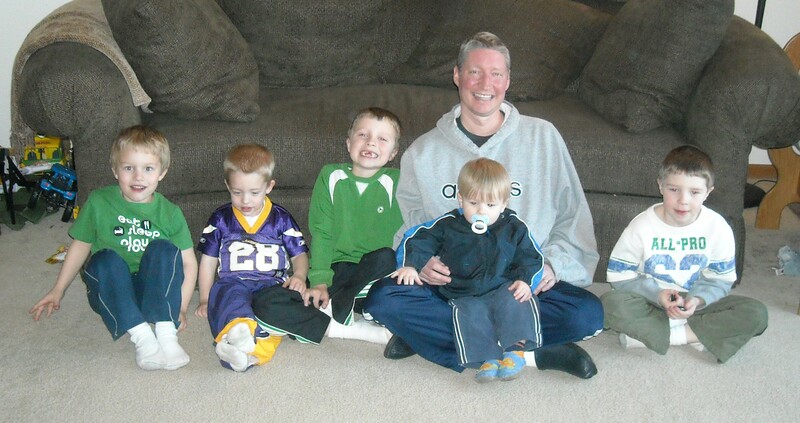 The picture above is of me, my guys and my nephews from last Wed. night. This was about the best picture we had of the 6 of us. Even the renowned photographer, Karen Baty, couldn’t get all the Baty Boys looking at the camera. A bunch of blonde boys, well with the exception of Jaxson. And of course if you want to get technical, my hair is more grey then blonde, but who wants to get technical. Below is part of an email I got forwarded to me last week. I am sure some of you have read it or seen it before, but I thought it was worth posting. It is a little lengthy, but I believe it is worth the read. > The atheist professor of philosophy pauses before his class and then asks one of his new students to stand. > ‘Yes sir, ‘the student says. > PS: the student was Albert Einstein . Adorable pic of you and the boys. Dr Belzer caught me in the hall yesterday. Says Hi and wishing you the best. You continue to be in his thoughts. You are looking great! Amazing philosophy story – Jade is taking a philosophy of religion class next term – I will show this to her tonight. You and your family are still continually in our prayers! ON THIS BEAUTIFUL JOURNEY WITH CHRIS ,FAMILY AND FRIENDS!! Beautiful ?? YES ! so many reasons but most important is seeing a real hero in our life time and seeing real honest,true FAITH, LOVE,COURAGE AND FRIENDSHIP THAT I IMAGINE IS LIKE ALL OF THE ANGELS IN HEAVEN! MY LIFE HAS FOREVER BEEN CHANGED BECAUSE OF THIS JOURNEY! I will not go into detail more information than anyone needs! But because I have come to have a passion and joy for people that I want to make a suggestion from the HEART!! FORGET THE COLON CANCER WALK! LETS PUT OUR ENGERIES TOWARD A REAL CAUSE! THE ENTIRE BATY CLAN! LETS MEET AT CHRIS’S HOUSE AND ALL WEAR BLUE T-SHIRTS AND CELEBRATE THE REAL PEOPLE IN THE FIGHT!! I WOULD BE WILLING TO PUT THIS TOGETHER. A PARTY FOR ALL OF US TO MEET,HUG,LAUGH AND CELEBRATE LIFE!